Now, I've had my fair share or fake meat products over the years. Fake wings. Fake burgers. Fake meat strips. 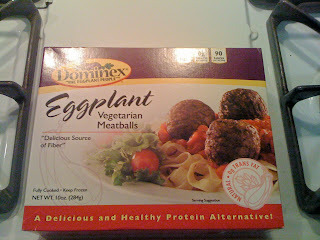 I've even had my fair share of fake meatballs, but I've never seen anything quite like the Dominex Eggplant vegetarian meatballs. I happened to be wandering aimlessly in my local grocery store and spotted these meatballs the other day. Being a HUGE fan of the Dominex breaded eggplant cutlets (but not the vegan eggplant burgers - those weren't my cup of tea), I decided to give this interesting meat substitute a try. 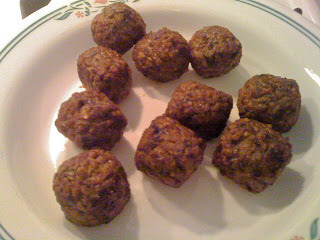 One serving (5 meatballs) has only 90 calories and 2.5 grams of fat - far less than most other meat substitutes. A dead ringer for regular meatballs, wouldn't you say? Having never eaten a meatball, I can't tell you if the texture is exactly the same, but they did seem almost frighteningly meat-like to me. You could definitely taste the eggplant (which is fine by me) in these little balls, but they had a nice Italian flavor over all. You can call me a fan. I ate them plain, because I'm weird like that, but I'd imagine that these would be great in pasta or crumbled up to use in a sauce that calls for sausage. Have you given these "meatballs" a try? I'd love to hear your thoughts on them. Do you know if these are vegan? I have their eggplant cutlets in my freezer and was googling ways to use them. These are seriously good. I have them with marinara on a hoagie. Best meatball sub ever! They are really good sliced up on pizza.